In each irrigation area there is a demand for water and a supply of water. The demand for water varies over time and depends on the types of crops, crop growth stages and on the climate (see Training Manual 3). While transporting irrigation water from the water source and applying it to the plant roots, a portion of the water is lost through evaporation, leakage from the canals and percolation below the roots of the crop. The scheme's gross irrigation need, SINgross includes these water losses. To express the percentage of irrigation water that is used efficiently and what percentage is lost, the term irrigation efficiency is used. See also Annex I in Training Manual 4. The supply of water to the irrigation system, SWS, should be almost if not equal to the demand for water, SINgross, which is the total of the irrigation need for all fields plus the water loss (see Figure 1) during transport and distribution. When the supply of water exceeds the demand, plants may receive too much water which has a negative effect on their growth. Or, on the other hand, costly water may be spilled and disappear into the drainage system. When the supply is less than the demand, the irrigation area may suffer from drought and plant production will decrease. Extension agents and field technicians need to be able to advise farmers on how to handle existing as well as anticipate future problems of water shortage. Problems may arise when an irrigation area is extended, or when new crops are introduced. The technician therefore needs to have an understanding of water shortage problems together with a knowledge of the correct approach, albeit simplified, to matching the supply with the demand for water. This chapter deals with the supply aspects of irrigation. Various types of water sources are presented which are largely what determine water availability. River and groundwater hydrology are beyond the scope of this manual, so that only a conceptual example is provided. The water needed to supply an irrigation scheme is taken from a water source. The most common sources of water for irrigation include rivers, reservoirs and lakes, and groundwater. Figure 2 shows a bird's-eye view of different irrigation water sources. The possibility of supplying as much water to the irrigation area as is needed during each period of the irrigation season depends primarily on the availability of the water at its source. Availability may vary a lot over the year, or even between one year and another. Secondly, the supply depends on the capacity of the facility installed to withdraw the water from the water source. Further, technicians should be aware that water must be available during each week or month of the growing season. This is illustrated with an example. - switching from a low water demand crop to a crop such as rice with high water requirements. This example shows that in month 4 only 80 ha can be irrigated adequately, although there is much more water available during the rest of the season. The month during which the ratio between the amount of water available and the irrigation need is lowest (the smallest potential irrigable area) is called the critical month. In the example above the critical month is month 4. - whether the facilities that control the tapping (gate, well, pump) and conveyance (canal, pipe) have a limited capacity. There may also exist water regulations which prohibit an unlimited withdrawal of water from the source. - by using a pump to lift the water above ground level and then let it flow to the fields. The tapping of water from a river or reservoir by gravity, and the pumping of water from a river, lake or groundwater are explained briefly. Rivers are used all over the world as sources of irrigation water. The most typical quality defining a river is that it flows, it is not a reservoir which contains a fixed amount of water. At each moment a new amount of water is passing any given location along the river. The flow of river fluctuates over time. The flows of some rivers fluctuate greatly over relatively short periods of time; these are mainly small local rivers which respond quickly to rainfall in their catchment area. A catchment area is the area from which a particular river or lake receives both surface flow and drainage water originating from precipitation. Figure 3 shows an example of a river catchment area. Other rivers show little fluctuation or vary only over a long period of time. These are mainly rivers with a large catchment area, where the rains are spread over a greater area and for a longer period of time. River flows vary considerably, not only within a given year, but also from one year to the next. 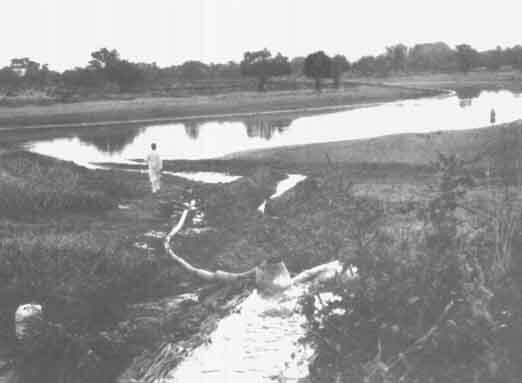 In a year with little rain during the rainy season, the river flow will be small; sometimes the river flow will cease altogether during the dry season (see Figure 4). The river flow will be far more in years with heavy rainfall during the wet season. The discharge of rivers is commonly expressed in cubic metres per second (m3/s). A simple method of measuring the discharge in canals is described in Training Manual 7, entitled "Canals". Although the method is applied to canals, it can also be used for small rivers. Irrigation Scheme 1 in Figure 2 is supplied with water that is directly diverted from the river without any structures, dams or other devices. The offtake canal is directly excavated through the river bank and no gate is provided. Consequently, there is no control of the discharge into the canal. The diverted discharge depends on the water level in the river. That means the discharge will be high during periods of high water and low during periods with a low water level. Usually, to avoid changes in the discharge, a control gate can be installed. The gate can then be opened completely when the river level is low, and opened only partly when the water level is high (Figure 5). The advantage of this system of water abstraction is its relatively low cost. However, the method can only be used when the river water level, even at low flows, is higher than the land which is to be irrigated. In other words, the point of diversion must be located at some distance upstream of the irrigation area, where the water level in the river is still higher than the level of the irrigation area. If the area is very flat, the canal distance may be too long to justify this simple river diversion system. To avoid the problems caused by fluctuating water levels in a river, a weir can be built across the river. During periods of high river discharges, water will flow over the weir. The water level upstream of the weir will show little variation during the year, and it will remain higher during the dry season than it would without the weir. Since the water level upstream of the weir is higher than it would normally be, the offtake structure can be closer to the irrigation area. Consequently, the main irrigation canal can be shorter. Scheme 2 in Figure 2 is irrigated with water that is diverted in this way. Figure 6 shows the difference in the location of the offtake with and without a weir. Figure 7 shows a weir made of local materials, which is constructed across a canal. The water level upstream is raised by some 20 cm and the flow is diverted to an irrigated plot through an offtake on the right bank. A low section of the structure functions as a spillway and discharges the surplus water downstream. 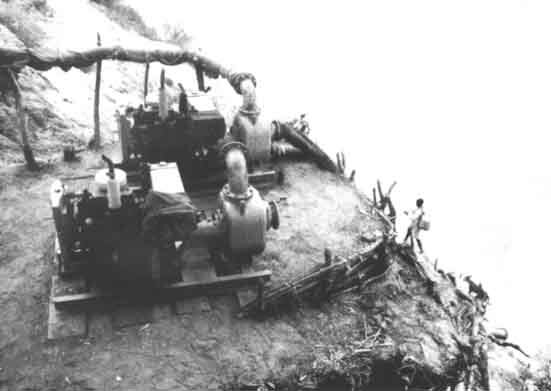 Scheme 3 in Figure 2 is supplied with water which is pumped directly from the river. The cost of pumping water increases with the size of the scheme. The cost of a weir, however, depends largely on the size of the river and only partly on the size of the scheme. Therefore, pumping is often used to irrigate small areas whose sources of water are larger rivers. Also, this may be a much less expensive solution than building a weir. Pumping is essential if irrigation by gravity is not possible. This will be the case when rivers lie well below field level (Figure 8). It is important to make sure that there will be no lack of irrigation water. If water is in short supply during some part of the irrigation season, crop production will suffer, returns will decline and part of the scheme's investment will lay idle. Irrigation schemes depend on the supply of water from the river throughout the irrigation season. The reliability of that supply is an essential factor in the success of the irrigation scheme. Thus, once the SINgross of a scheme has been estimated, the flow of the river and the reliability of that flow during the irrigation season must be ascertained. The availability of river water will fall into one of the three scenarios described below. i. The river flow is sufficient to meet the SINgross only when the flow is abundant. Because the river flow fluctuates during the year, and over the years, water shortages do occur when the flow is low during dry months of the year and during dry years. It may be ascertained during which months of the year the river has its lowest discharge. It is clear that under such circumstances any change in irrigation practices resulting in higher irrigation needs during the dry months should be discouraged. ii. The river flow is abundant as compared to the SINgross even during dry months of the irrigation season, but water shortages do occur in dry years. A change in irrigation practices which requires more water, or small scheme extensions, may result in more severe water shortages in the future. iii. The river flow is always much greater than the SINgross over the irrigation season, and this remains true over the years. There has thus never been a problem for the irrigation scheme as regards water availability. This can be checked with local farmers. In this case, there will be no problem with small scheme extensions, or with the introduction of crops, such as rice, which consume a lot of water. The best solution is to consult the hydrological service. This service has information on water resources and river flows as they collect hydrological data, such as rainfall and discharges of rivers and streams. They can estimate the minimum river flow during the irrigation season based on historical records and predict the minimum river flow for a dry year. If, however, no measurements of river discharge are available, then data collection must start as soon as possible so that future plans may be made based on reliable data. It may happen that the river flow during one part of the irrigation season is limited, while at other times during the season a large surplus of water is available. Part of this surplus can be stored by constructing a dam in the river. The stored water can then be used in addition to the available river flow. The cost of building a dam however is high, and expert help should be sought to study alternatives and produce appropriate designs. Lakes are natural depressions of the land which are filled up with water. Fresh water lakes have a natural outlet through which the lake discharges superfluous water. Lakes are supplied with water by rainfall that falls directly on the surface of the lake, by water run-off from the adjacent land and small streams, or by groundwater that seeps through the soil to the lowest point which is the lake. Lakes lose water via evaporation from the lake's surface, via the lake's natural outlet (overflow), or through percolation from the bottom of the lake to the groundwater. The supplies and losses of a lake are shown in Figure 9. A reservoir is an artificial lake. 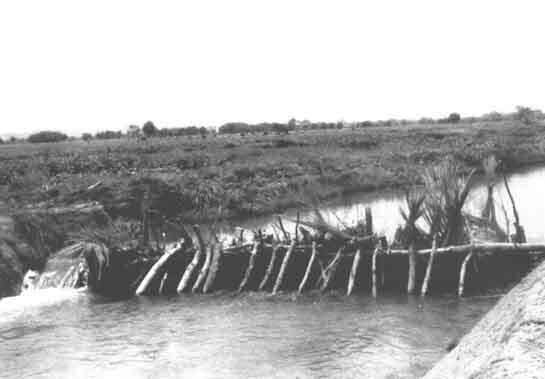 It can be formed by building a dam across a valley, by excavating the land or by surrounding a piece of land with dykes. The water is stored in the reservoir and can be used for irrigation. Huge reservoirs are built by damming major rivers, which can supply water to large irrigation areas measuring thousands of hectares. Small and medium sized reservoirs have a far more modest capacity, with enough water to irrigate 10 to 100 ha in one season. This training manual focuses on the latter type of reservoir. What has already been explained for rivers, applies also to lakes. The amount of irrigation water required must be less than the quantity of water which is available in the lake. When lakes are supplied with water from rivers, their level may vary from one year to another depending on the river. When lakes are supplied from groundwater, their water levels fluctuate more slowly, following the level of the groundwater. The amount of lake water available for irrigation may be calculated as the difference between the water available in the lake and the amount lost due to evaporation and seepage. For large irrigation schemes, local or national authorities will be responsible for evaluating the available quantity of water. They will have data on river flows and groundwater supplies. They can also estimate the evaporation and percolation losses and will have information on other uses for the water. - area of the reservoir (in the case of an artificially excavated storage area). A dam built in a valley will block the river or stream and water can then be stored behind it. The deeper and wider the valley, the more water that can be stored. This is called on-stream storage (see Figure 11). Water can also be stored off-stream by diverting the flow into a natural depression or dead river branch alongside the river, or by constructing a storage reservoir. This is similar to the lake situation. Evaporation from open water can easily reach 7 mm per day in arid or semi-arid countries. This equals 5 cm per week and 20 cm per month. The amount of water lost by evaporation can be considerable, particularly in reservoirs which are large and shallow. Therefore, irrigation from shallow lakes and reservoirs should be started as soon as possible after the rainy season. Wait too long, and the reservoir may well have dried up. Because the cost of building and maintaining a reservoir can be significant, expert help should be sought in planning and constructing a dam. Specialists can calculate the volume of runoff water, anticipate water losses from the reservoir and estimate the quantity of water available for irrigation. They should also be able to provide correct engineering designs and sound construction techniques to ensure the stability of the dam, including spillway arrangements to pass excess water safely downstream without harming the dam. Water stored in a valley usually has a higher level than the valley bottom downstream of the dam. Because of this difference in level, the valley can be irrigated by a gravity system. Water can be taken from the reservoir via a concrete or steel pipe. This pipe connects the reservoir to an irrigation canal downstream. A valve is usually located on the upstream end of the pipe to control the discharge water into the canal. 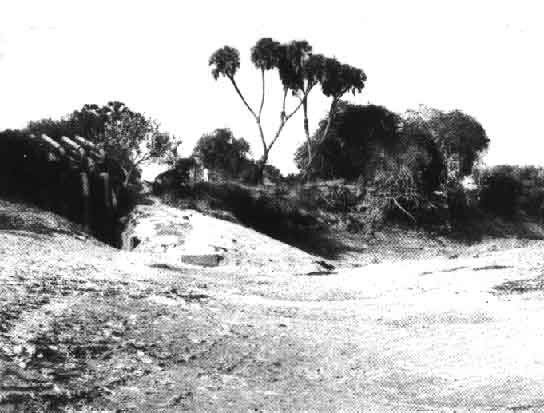 Figure 12 shows the head of an irrigation canal in front of a dam. This canal is supplied with water which is stored behind the dam. The fields located around the reservoir upstream of a dam or surrounding a natural lake are higher than the reservoir or lake's water table. Irrigation here will only be possible with the help of pumps. The water level in the reservoir will usually be highest at the end of the rainy season, and lowest at the end of the dry season or the irrigation season. Pumps installed at reservoirs and lakes must be able to handle these fluctuations, which are not only vertical, but which are even more pronounced horizontally, because the water recedes back to the lowest parts of the reservoir. A dead branch of a river can also be made to function as a reservoir. The branch is filled with water during the wet season and closed off during the dry season so that the stored water may be used. 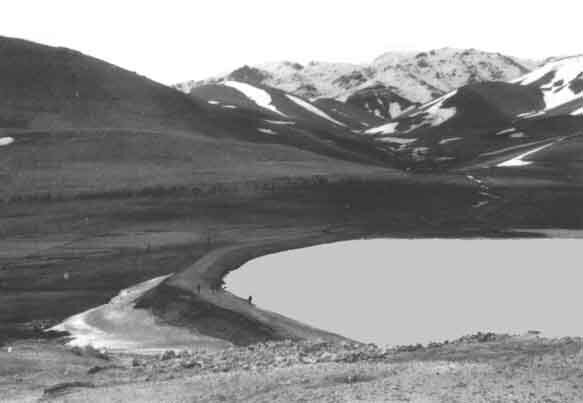 Due to the low water level, pumps will normally be needed to irrigate fields from such a reservoir (Figure 13). Groundwater is an important source of irrigation water, especially for small-scale irrigation projects. Because groundwater is only available below ground level, it must be lifted, or pumped before it can be used. Pumping groundwater from wells is a well known method of utilizing groundwater the world over. To understand how groundwater functions, think of it as a series of lakes below the surface of the earth. The earth is built up of different layers - sand, gravel, clay, rock, etc. The layers of rock or compact clay cannot store water as they are solid, rather than porous. The layers of coarse sand and gravel, on the other hand, contain many pores and cracks, which allow rainfall to enter the soil and percolate from the surface. These porous layers filled with water are called aquifers. Groundwater flows, in most cases, slowly to the lower parts. Where the aquifer meets the surface, the groundwater flows out of the soil into, for instance, a river or a spring as shown in Figure 14. Groundwater may be found close to the surface or at profound depths. In coastal plains the groundwater is often brackish or saline due to the proximity of the sea. Inland groundwater may also be brackish in places where the soil contains many soluble salts. Such water cannot be used for irrigation. The availability of groundwater is less irregular than that of small rivers. Aquifers at shallow depths, however, are likely to be very thin with a limited storage capacity for groundwater. One may start pumping the water during the rainy season, after the aquifer has been replenished, and find a dry well after a few months. Generally, local farmers know the wells in their areas. When digging a new well, it is always wise to consult local farmers and benefit from their experience of existing wells in the neighbourhood. The total water availability from shallow groundwater is determined by the number of wells and the capacity of these wells, or by the capacity of the pumps installed, whichever is smaller. When a borehole is driven to access deep groundwater, the engineer always carries out pump tests to measure the capacity of the well. The volume of water stored in deeper aquifers is quite large, so that the only limitation to water availability is the capacity of the well and the pump to be installed. Excessive exploitation of the groundwater by many users, however, will bring about a decline in the water table. To ensure a stable supply of groundwater, the rate of use should not exceed the rate of recharge. When pumps and other equipment break down, the resulting lack of water can be critical for plant growth. Ideally, a spare pump should be kept on hand in case of breakdowns in the main pumping system, as it can take a long time to repair or replace equipment. To tap groundwater, a well must be dug deeper than the groundwater level. The groundwater then seeps through the pores of the surrounding soil or porous rock into the well until the level of water in the well is the same as the level of the groundwater. 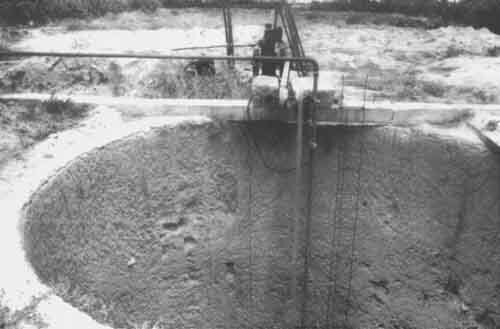 When the groundwater lies within a few metres of the surface, exploitation is possible with shallow wells which are mostly dug by hand. These wells normally have a diameter of 1 metre or more and are dug below the groundwater table. 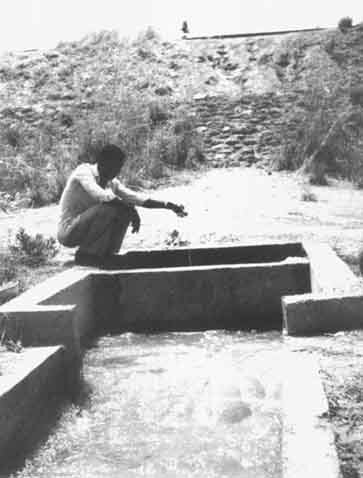 Water is pumped from these wells, often using human or animal power but, increasingly, with small diesel-powered pumps (see Figure 15). The amount of water that can be abstracted from shallow wells is limited, and, as a result, the areas which are irrigated from these water sources will also be limited. When the groundwater level is very deep, constructing a hand-dug well becomes impossible. Deep wells must be drilled into the ground. Generally, submersible pumps are installed below the groundwater table to lift water to the surface. They may be driven by an electric motor or a diesel-powered engine on the surface with a long vertical shaft, or by a submerged electric motor inside a waterproof casing. Figure 16 is an illustration of deep wells equipped with submersible pumps. In case A, both pump and motor are submerged, while in case B, only the pump is submerged. The case B pump is driven by an electric motor located at the surface. In both cases, pumped water is pushed up the riser pipe to the surface.